The band has been an integral part of the Company’s social life since its foundation in 1971 as the Elliott Musicians Society. This was a particularly thriving section of the Elliott Sports and Social Club, which combined the social activities of GEC Elliott-Automation and Marconi-Elliott Avionic Systems at the Airport Works in Rochester, Kent. It began life as a music club with the aim of providing an opportunity for musicians within the company to join together in all kinds of ensembles to perform anything from jazz to classical works, while appealing to a wide range of musical tastes. Seven musicians from a very broad musical background originally met to share their desire in forming a brass band with a particular emphasis towards charity work. The first meeting established there was sufficient interest, drive and musicianship within the ‘Magnificent 7’ to form the nucleus of a band and it was not too long before Elliott Concert Brass was finally formed. Membership swelled to 36 including several junior players. Bill Skinner was the first Musical Director and it was due to his dedication and enthusiasm with the support and involvement of President, Alf Harrison, that the band was in constant demand during its developing years throughout the 70’s and early 80’s, performing at numerous functions in local venues, assisting charities with their fundraising events and supporting Company engagements such as the Christmas carol service and annual pantomime! Under normal circumstances, the financial obstacle of acquiring instruments, uniforms, music, etc may possibly have prevented any further progression, however the band was most fortunate to gain full sponsorship from the Company at that time in recognition of the hard work in supporting several functions organised by local charities. In 1980, Bill Skinner was unfortunately forced to retire from brass banding following a prolonged period of ill health and was replaced in 1981 by Ian Walton. 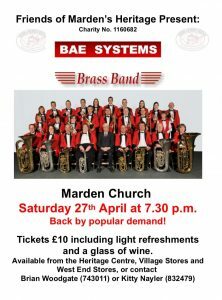 During his five year service as musical director, the band prospered musically and in presentation continuing to perform at concerts both in Kent and Essex. Ian decided to retire from the brass band world in 1986 to pursue his other musical interests. It was coincidental that at this time, Trinity Brass from Maidstone was undergoing some changes and it was decided that a trial marriage should take place by amalgamating the two bands. A new Musical Director, Mr Ted Clarke, MBE, was appointed and the honeymoon proved to be a great success. The combined membership was registered as GEC Avionics Brass Band for entry into both regional and national brass band contests the following year. Ted was also forced to retire due to domestic circumstances in January 1988 at which stage, the band’s principal cornet player, Keith Woodger agreed to take over the baton quoting his words, ‘in a caretaker capacity’. Keith continued to lead the band for over 25 years, after accepting the full time post until he sadly lost his life to cancer in 2014. Following Keith, Jonathon Crowhurst was appointed to lead the band. His time with the band included winning the Regional 3rd Section contest at Stevenage in 2015 and promotion to the 2nd Section. It also involved an appearance in the National Championships 3rd Section final at Cheltenham in September 2015. Today, Melvin White leads the band having taken over from Keith, Melvin’s musical career details can be found on the Musical Directors Page. The band have enjoyed success in contesting over the following years, with promotion from 4th Section to 1st in the Southern Counties Brass Band Association and appearance in the Finals of the National Brass Band Championships on no less than four occasions. Opportunity has always been taken wherever possible to tour throughout Europe in between the diary of engagements and contesting dates, visiting Holland, Belgium, France and Germany. The band has also been honoured to perform at an impressive variety of prestigious and significant venues including the Menin Gate, Canterbury Cathedral, Farnborough Air Show, International Festival of the Sea, Grosvenor House Hotel, London Parks and Canada House, Canary Wharf. A number of players in the band have been together for many years and we have several married couples within our membership, together with mothers, fathers and children. The members of the band are all amateurs and receive no payment or expenses in return for their services.